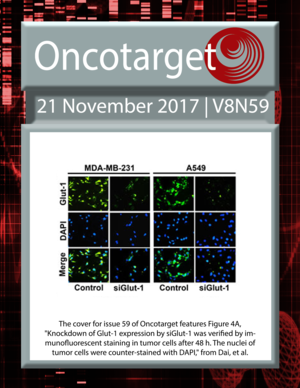 The cover for issue 59 of Oncotarget features Figure 4A, "Knockdown of Glut-1 expression by siGlut-1 was verified by immunofluorescent staining in tumor cells after 48 h. The nuclei of tumor cells were counter-stained with DAPI," from Dai, et al. Liraglutide: another reason to target prediabetes? T cells in chronic lymphocytic leukemia: can they fight? The sexist behaviour of immune checkpoint inhibitors in cancer therapy? 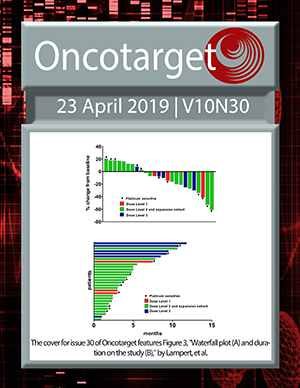 A bioinformatics-to-clinic sequential approach to analysis of prostate cancer biomarkers using TCGA datasets and clinical samples: a new method for precision oncology? Challenges and future of biomarker tests in the era of precision oncology: Can we rely on immunohistochemistry (IHC) or fluorescence in situ hybridization (FISH) to select the optimal patients for matched therapy?